The Table of Ranks (Russian: Табель о рангах, translit. Tabel' o rangakh) was a formal list of positions and ranks in the military, government, and court of Imperial Russia. Peter the Great introduced the system in 1722 while engaged in a struggle with the existing hereditary nobility, or boyars. The Table of Ranks was formally abolished on 11 November 1917 by the newly established Bolshevik government. 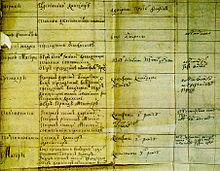 The Table of Ranks re-organised the foundations of feudal Russian nobility (mestnichestvo) by recognising service in the military, in the civil service, and at the imperial court as the basis of an aristocrat's standing in society. The table divided ranks in 14 grades, with all nobles regardless of birth or wealth (at least in theory) beginning at the bottom of the table and rising through their service (sluzhba) to the tsar. While all grades were open by merit, promotion required qualification for the next rank, and grades 1 through 5 required the personal approval of the tsar himself. Despite initial resistance from noblemen, many of whom were still illiterate in the 18th century and who shunned the paper-pushing life of the civil servant, the eventual effect of the Table of Ranks was to create an educated class of noble bureaucrats. Peter's intentions for a class of nobles bound to the tsar by their personal service to him were watered down by subsequent tsars. In 1762 Peter III abolished the compulsory 25-year military or civilian service for nobles. In 1767 Catherine the Great bought the support of the bureaucracy by making promotion up the 14 ranks automatic after seven years regardless of position or merit. Thus the bureaucracy became populated with time servers. Achieving a certain level in the table automatically granted a certain level of nobility. A civil servant promoted to the 14th grade gained personal nobility (dvoryanstvo), and holding an office in the 8th grade endowed the office holder with hereditary nobility. Nicholas I raised this threshold to the 5th grade in 1845. In 1856 the grades required for hereditary nobility were changed to the 4th grade for the civil service and to the 6th grade for military service. The father of Vladimir Lenin progressed in the management of education, reaching the 4th rank and becoming an "active state councillor" (действительный статский советник), which gave him the privilege of hereditary nobility. With occasional revisions, the Table of Ranks remained in effect until the Russian Revolution of 1917. The table below contains the military ranks of the Guards (infantry and cavalry) 1722 until 1917. Peter I stipulated that "princes related to us or married to our princesses always take precedence" and that when military officers of the army and navy were of the same rank, "the naval officer is superior at sea to the land officer; and on land the land officer is superior to the naval officer". He laid down that fines of two months' salary should be assessed against those falsely claiming a higher rank or gaining a rank without qualification. He stated that service with a foreign monarch would not automatically confer the rank until approved by the tsar, as "we do not grant any rank to anyone until he performs a useful service to us or to the state", while women were to "advance in rank with their husbands". Outside that table are the rank of Generalissimus, which was a honorary title and not a military rank and the title of Patriarch, which theoretically equaled the eminence of the Russian Emperor, but which Peter the Great kept vacant between 1700 and 1720 and eventually substituted for the collective board of the Most Holy Synod, effectively turning the Church into a department of the state. The first complete translation into English of the original Table of Ranks promulgated by Peter the Great in 1722 was presented by Brazilian historian Angelo Segrillo in 2016. It is available online at http://lea.vitis.uspnet.usp.br/arquivos/arttableofrankslea.pdf. ^ The Russian word "действительный" means "actual, valid, real, effective, true" and in this context is sometimes translated as "actual" or "acting" (which has the disadvantage of confusion with the English language concept of acting rank). Waliszewski, Kazimierz. "The Social Reform — The Table of Ranks". Peter the Great: his life and work. Forgotten books. pp. 454–456. ^ Catherine A. Schuler (1 May 2009). Theatre and Identity in Imperial Russia. University of Iowa Press. pp. 16–18. ISBN 978-1-58729-847-9. ^ Marc Raeff (18 May 1966). Origins of the Russian intelligentsia: the eighteenth-century nobility. Harcourt, Brace & World. pp. 91–92. ^ Richard Pipes (1990). Russia Under the Old Regime. Penguin. p. 135. ^ Geoffrey A. Hosking (1997). Russia: People and Empire, 1552-1917. Harvard University Press. p. 155. ISBN 978-0-674-78119-1. ^ Louis Fischer (2001). The Life of Lenin. Phoenix. p. 6. ISBN 978-1-84212-230-3. ^ In case of «His/ Her Majesty highest of all protégé», the period of time, set for promotion to the next higher rank, might be shortened by one year. ^ Table of ranks, section infantry and cavalry 1722 to 1917, called, 7 May 2017. ^ "«Табели о рангах»…". КУЛЬТУРНЫЙ ЛАНДШАФТ (in Russian). 2013-02-05. Retrieved 2019-02-25. ^ Segrillo, Angelo (November 2016). A First Complete Translation into English of Peter the Great’s Original Table of Ranks: Observations on the Occurrence of a Black Hole in the Translation of Russian Historical Documents (PDF). São Paulo: LEA Working Paper Series, no. 1. pp. 6–9. Modern Russian military ranks trace their roots to Table of Ranks established by Peter the Great. Most of the rank names were borrowed from existing German/Prussian, French, English, Dutch, and Polish ranks upon the formation of Russian regular army in the late 17th century. Praporshchik is a rank in the Russian military, also used in other uniformed services of the Russian government such as the police. It was a junior officer rank in Imperial Russia. However, in the 1970s Praporshchik was restored as a separate career group between non-commissioned officers and officers. The Page Corps was a military academy in Imperial Russia, which prepared sons of the nobility and of senior officers for military service. Similarly, the Imperial School of Jurisprudence prepared boys for civil service. Although not established until 1943, the modern equivalent of the Page Corps and other Imperial military academies can be said to be the Suvorov Military Schools. The Russian court councilor was a civilian rank of the 7th class in the Table of Ranks.